I haven’t really talked about the subject of Binge Eating or Eating Disorders on my blog because I felt like I wasn’t really qualified to give advice. I’m not a dietitian. I don’t have a medical degree and I am definitely not a mental health professional. With the recent outrage against Marie-Claire and the much needed discussion in the blogging community about Eating Disorders, I wanted to share my OWN experiences with compulsive eating. And let me stress this again: I am not a professional. This is just my story. I haven’t addressed it honestly because I thought my blog is pretty self-explanatory. I mean, I wasn’t 250 pounds because I ate salads and watched my calories! I don’t know that if I can really say I was a binge eater when I was obese. I was definitely addicted to sugar. I had a sweet tooth that was out of control. I was also ignorant to portion control. If you haven’t checked out the blog Fit to the Finish, you must! Her story is amazing. She lost 150 pounds. One of her recent posts sparked a memory for me. She told a story about her Confession Brownies. I have a similar story. I used to bake. A lot. I loved baking, it was something I did very well. I’d try new recipes and once in awhile I’d alter the recipe or change it up (which is very unlike me because I am a Recipe Follower). I’d bake brownies from scratch, I made the best chocolate chip cookies you’d ever eat. One of my favorites to do was Lemon Squares. Mmmm. 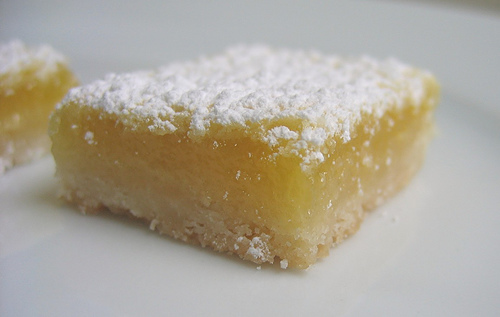 My mouth waters at just the thought of Lemon Squares. If you remember last weekend, I posted about the No Pudge Brownies I made. I will admit it’s been awhile since I baked anything. I did not trust myself to have those things in the house. Just the thought of it caused me anxiety. The only desserts I’ve had in the house the last year or so were those chocolate chip cookie dough packages you can buy at the store. Why? Because I’d bake one serving at a time and I did not overindulge. We also had ice cream in the freezer off and on. That used to be a big no-no for me because ice cream was one of my trigger foods. Our freezer isn’t easily accessible (you have to bend down to open it) which seems silly but just that fact alone makes it so I rarely look in the freezer. There have been some recent stressors in my life lately. When I was 250 and I’d bake, I remember feeling like those treats were calling to me. I’d try to avoid them. I’d try to “be good.” I’d try REALLY hard not to keep eating them…but then my willpower would falter and I’d eat them all. That happened too many times to count in my life. It’s embarrassing. It causes me shame even to this day. Cutting the brownies out of the pan length-wise so it didn’t look like I’d eaten half of them already. Resorting to treats to make me happy when life wasn’t. Well this weekend those damn No Pudge Brownies brought back those feelings for me. Suddenly it felt like they were calling to me. Those brownies (and cupcakes from a friend) were all I could think about when I was in the house. To shake myself out of these behaviors I told myself to STOP obsessing. Who cares if there are brownies on the counter in plain sight? That doesn’t mean I have to eat them all. And it’s OKAY to eat one brownie. Or two. I don’t work out and eat healthy to deny myself of treats once in awhile. I talk about moderation a lot and sometimes simply reminding myself of my 90/10 Rule is enough to snap me out of it. It’s been a long time since I’ve had this issue rear it’s ugly head. I was honestly taken a little aback that I was having those feelings again. How am I working on my issue? Realize I’m not perfect. And I DON’T HAVE TO BE PERFECT. Remind myself it’s okay to have negative emotions and eating them away is not the answer. 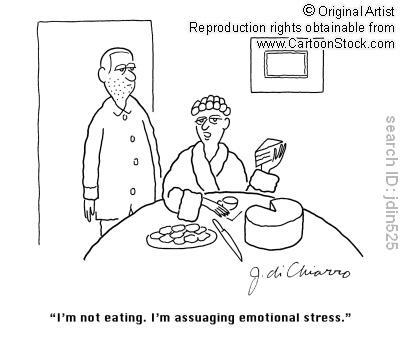 Anticipate potential stressful times and don’t have trigger foods in the house during those times! Keep myself busy during times when I feel like I might have an issue. When I get the urge to bake, take half of them to work or give them to friends and only have a few on hand in the house. Continue my normal exercise routine. I do not punish myself with exercise when I overeat. Exercise is an outlet for stress and it also makes my body feel good. I want to keep it that way! I’m not beating myself up for eating more treats the last few days. It’s not worth getting upset about. Life is meant to be enjoyed. I don’t work out as much as I do to NOT eat and NOT enjoy living. QUESTION: Do you have any tricks or tips to avoid bingeing? I feel like I should print out this post and put it up on my bulletin board – not necessarily for now but for THEN. When I feel like that. Cuz, darlin, do I hear ya. There’s some logic for you. Chris actually brought home Pepperidge Farm cookies the other night. I have no idea why. Fortunately, they’re a kind I’m not particularly interested in (in fact, I had forgotten about them until right now). At this moment, I just refuse to let a cookie have power over me. It’s a baked good, for criminy’s sake! It’s funny how logical the situation is until you’re in it! I love Pepperidge Farms cookies. The mint ones were my downfall. I waste perfectly good food. Most of the time I will take one piece (of whatever goodie) and let the rest of it sit out until someone else eats it. However, if no one eats it, and I find myself going back for more, I will take an entire batch of cookies/ENTIRE CAKE (minus the slice i ate) and throw it in the garbage. Gone. No one eats it. And I have to do it in secret because people will actually GASP! at the sight of me chucking so much good food in the trash. But honestly those same people weren’t going to eat it anyway. If you give me a plate of cookies for Christmas, or share your Grandma’s fudge, etc. this is what happens to it. I’m sorry. I’m actually writing a post about that. It’s an interesting topic. Oh, wow! I LOVE this! I can totally relate…I think many of us can. I tend to binge eat when I’m bored, which, as a stay-at-home-mom, happens a lot. We have cookies, etc in the house all the time because my kids like them (and frankly my daughter need high-calorie food) but I tend to snack on them too. I hate that a stupid cookie or a container of pudding or whatever has control over me. Great post! I think we need to talk about this more! I think with EDs the tendency is to say that if someone doesn’t fit into the “clinical definition” of an ED then they are not suffering! Anyone w/ ED symptoms is SUFFERING and doing damage to their body! Luckily we are very resilient! And, I try to remember how I feel when I lay my head down at night…when I’ve let my addiction take hold of me then I hate myself, but when I stay strong I love myself. I want to be free from that guilt and hatred so I do better. I also choose healthier options (I’ve blogged many of these recipes) b/c they fill me up more and I don’t feel so crappy and I don’t eat as much. GREAT post! Great job shedding some light on this subject! I think it’s an important topic and one that was getting lost in all of the “How dare Marie Claire magazine” drama. Thanks for sharing your link! I’m so proud of you for recognizing! Stopping and blogging about it. Scary isn’t it? I hate when things are humming along then some crazy disordered ED thought comes on in and you weren’t expecting it. Just keeping us on our toes. 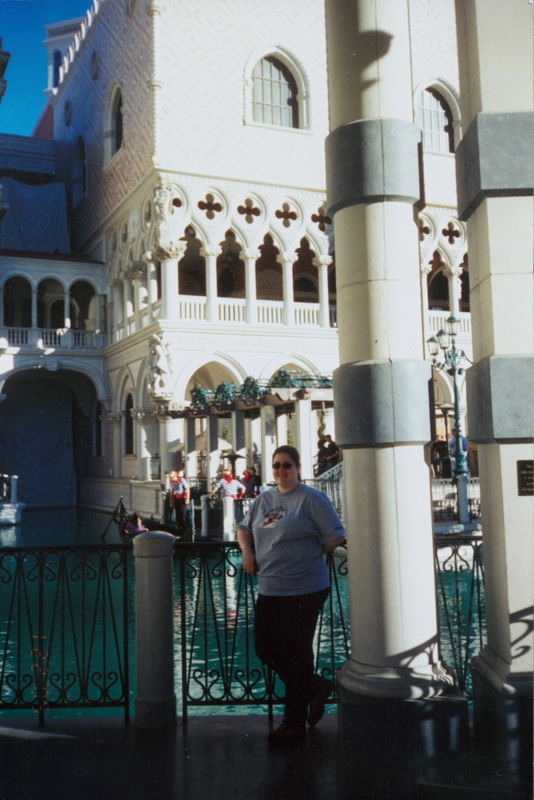 Had a couple rough days over in this area of the world too. Big hug, hope everything will be ok and that you’re taking care of you. Thanks Rita. I think I survived this latest surprise visit pretty well. It was weird to go so long without the thoughts, to then have them pop back up. These days, when I get to that point… I take drastic measures because I recognize what I’m doing. It’s scary how far you can come only to have these things rear their ugly head again. It can really shake ya. I definitely wasn’t expecting it! Awe yes! You brought up a good point I neglected to mention: FUN. Eating good food is FUN. That makes it extra hard. I try and not keep a lot of snacks in my house. They are just too tempting for me. I know my limitations and even after losing weight I still have the the tendency to eat something just because its there. I am not sure that will ever go away. Great blog! I’m a producer for a hit TLC show and we’re currently looking for ADULTS who BINGE EAT for the show! If any readers/commenters are interested, write back at pickyeaterscasting@gmail.com or give me a call at 323.904.4680 x1147. I know this is an old post but I came across it while writing my own post on emotional eating (which often turns in to binge eating for me) and I just wanted to say I really enjoyed reading it – and the rest of your blog. You’re drive is really inspiring – I look forward to keeping up with your continued progress! Hi Amy, thanks for leaving a comment. I appreciate your kudos. My hope is that my blog can inspire people! 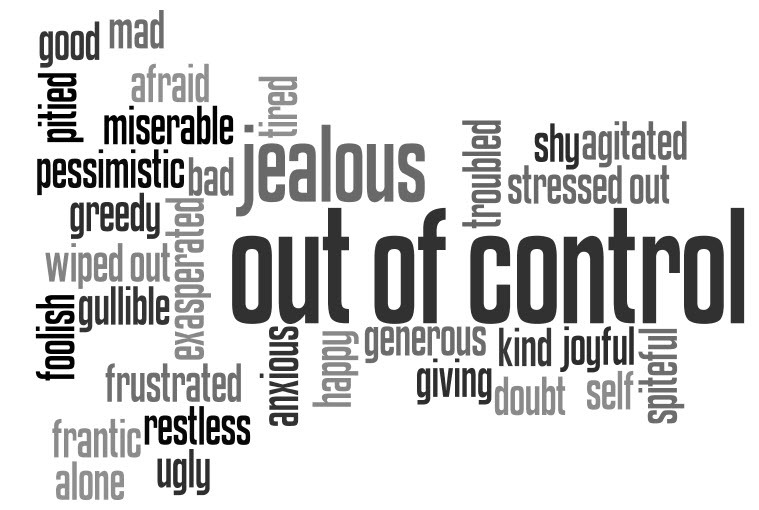 think of a more positive and realistic perspective, once negative thinking patterns are recognized. I can totally relate to this. I just recently started baking more because I work from home more often. While baking can be such a soothing activity it’s so hard to not indulge while I do it. I am always trying to establish a balance between healthy boundaries and genuine flexibility with food. It’s a dance for sure! Great post and great ideas to stop binge eating.